Rising in the Black Forest region of Germany the Danube flows a curving 1770 miles through Central and Eastern Europe before reaching the Black Sea. 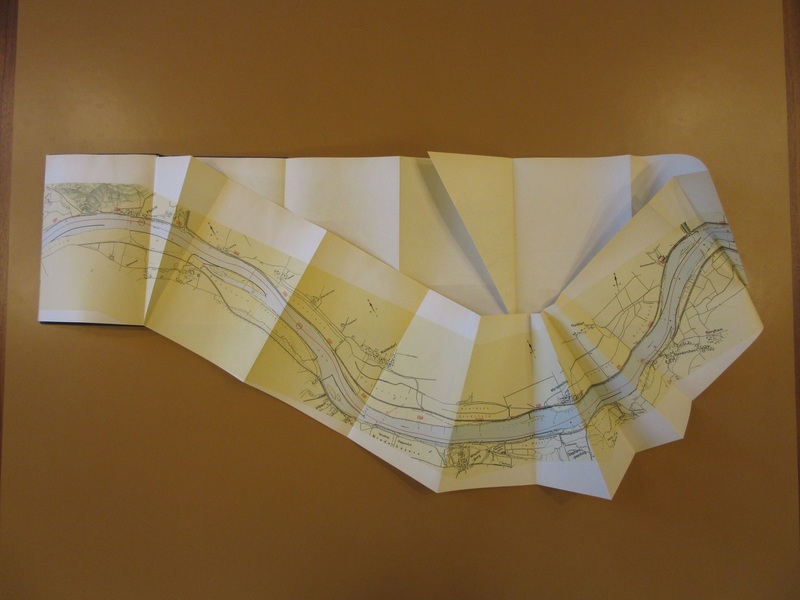 As well as an important shipping route the river forms part of the national borders of seven European countries. 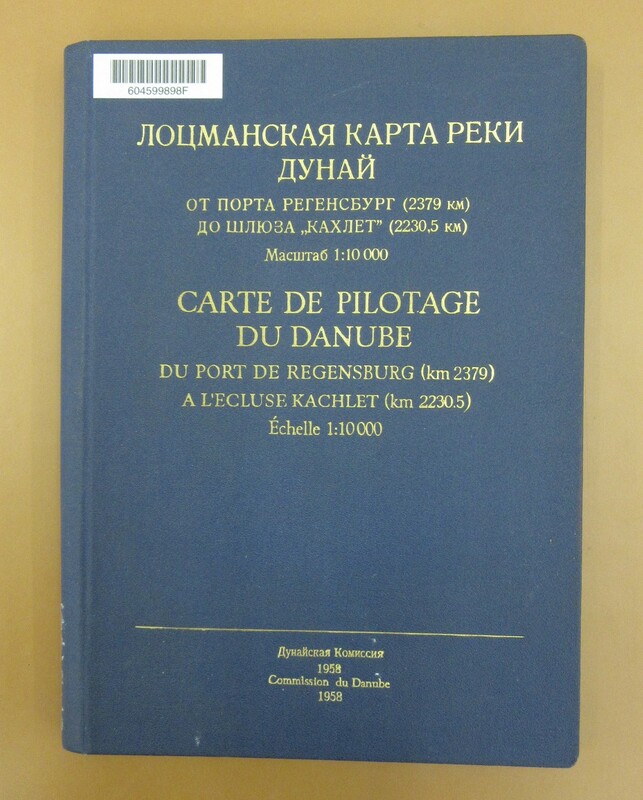 The first Commission to aid navigation and control safe and clear passage of the river was created during the Congress of Paris in 1856, following the end of the Crimea War. This was replaced by an International Commission during the Treaty of Versailles in 1919 which lasted until the outbreak of World War Two. 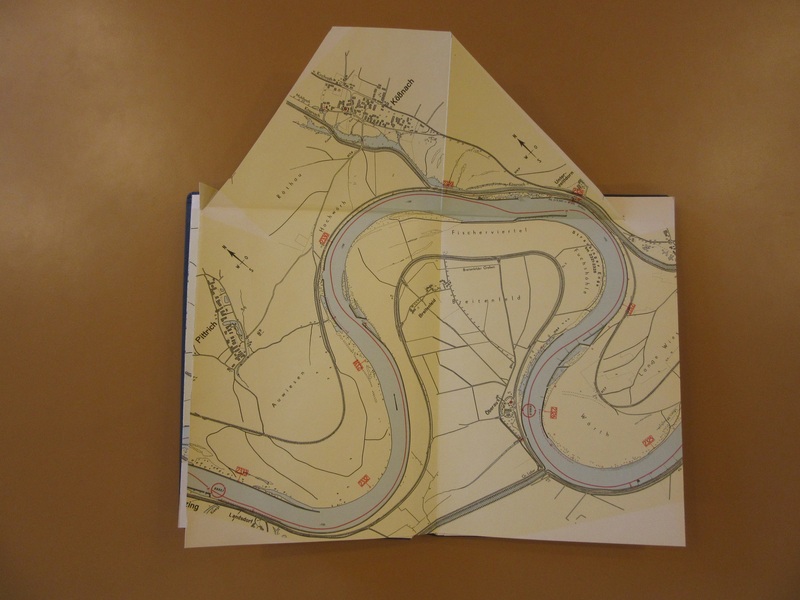 Following German defeat in 1945 a new Commission was created, and it is this Commission that has produced a series of books of maps covering the course of the river as an aid to navigation. 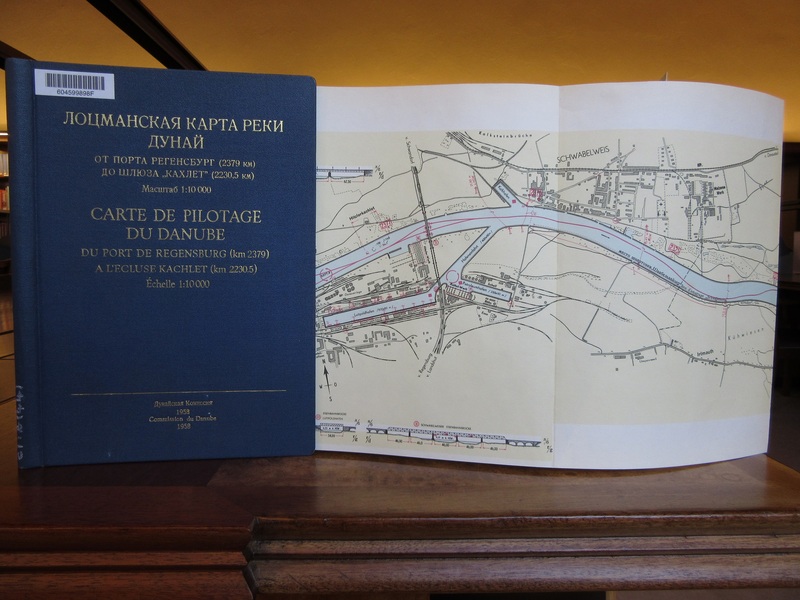 With a mixture of Russian and French text and German mapping the book shown here covers the river from Regensburg – the furthest upstream navigable by large craft – to Kachlet, in the Bavaria region of Germany. The cover gives no hint to the wonders within. 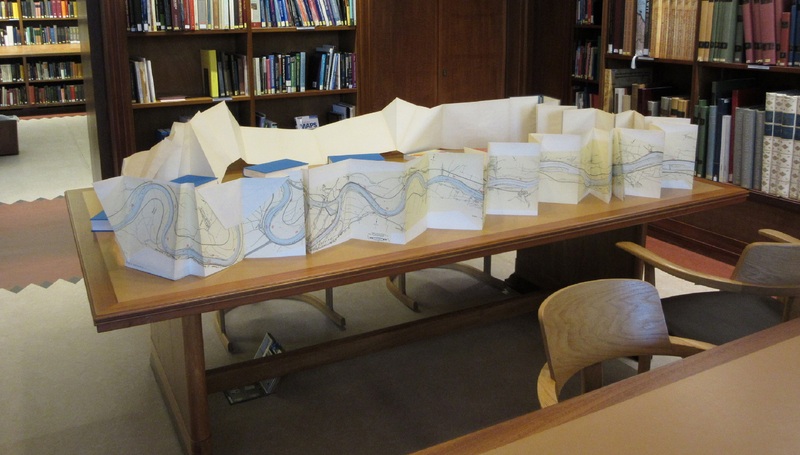 A long and continuous strip map follows the river at a scale of 1:10,000 and provides information on, amongst others; bridges, ferry crossings and power cables. The red numbers in boxes show the kilometres remaining to the sea. and additional sections have been added to create a practical as well as an impressive work. This entry was posted in Exploration on 25 February 2016 by Dan Q. 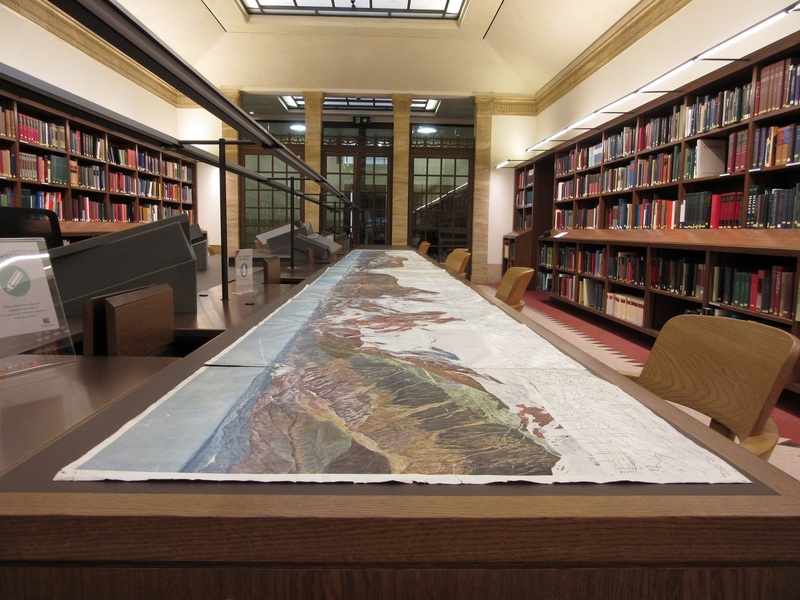 At 628 centimetres this view from the summit of Mont Blanc is, after the Sheldon Tapestry, the longest map held in the Bodleian collection. This panoramic view has been created by joining together the 13 sheets and title page from a collection of views of, and from, Mont Blanc. Mont Blanc is the highest mountain in the Alps, and forms part of the border between Italy and France. 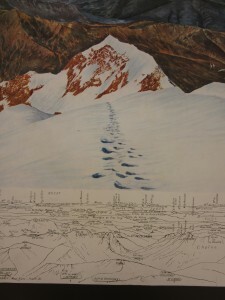 Part of the view includes the tracks to the summit made by the illustrator, Paul Helbronner, a major figure in the cartography of the French Alps. 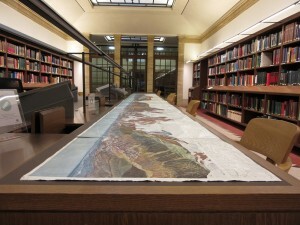 Featured in this photograph is the MacKerras Reading Room, on the 1st floor of the Weston Library. This is the Music Reading Room, and has books on music, composers and scores on the shelves. 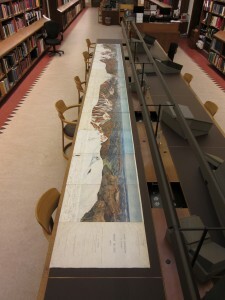 The MacKerras is part of the Special Collections group of rooms and, along with the Rare Books Reading Room is where manuscripts, modern papers and rare material, as well as music books, are consulted. This entry was posted in Cartography on 4 February 2016 by stuart.